If happiness begins at home, then the current mood around Irish football really does make sense. For the FAI, the maiden Lansdowne appointment for a new manager tends to be a good-spirited affair. 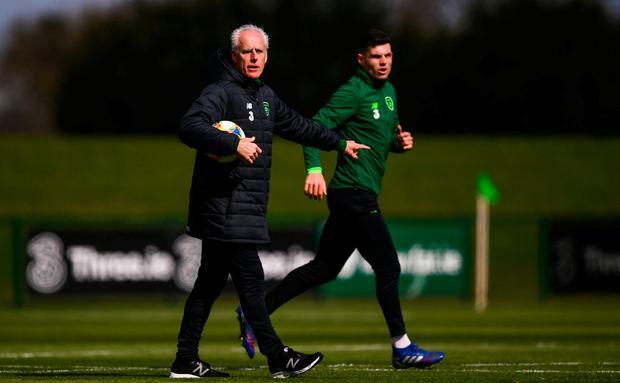 Granted, Mick McCarthy may be an old face but the extent to which things are unravelling for the FAI leaves the suspicion that any manager would have faced the same questions that the 60-year-old did yesterday. Talk of protest and unrest is not an ideal way to start a campaign. 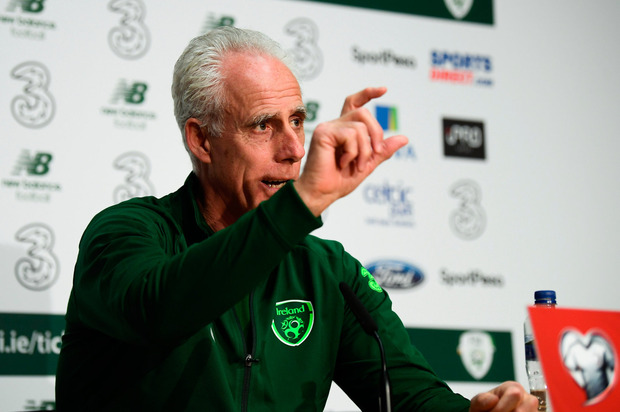 The pressure around Euro 2020 meant the honeymoon period was always going to be brief for McCarthy, but it's tough for the manager to speak about parish problems. He was keen for a shift in discussion towards the football, an area where the team itself actually does have problems at home that it needs to address. It was at the Aviva Stadium where Ireland's World Cup 2018 campaign hit the ropes. Martin O'Neill's side were top of the group with six games to go, four of which were scheduled for Dublin. Two points from nine against Wales, Austria and Serbia ended automatic qualification hopes. In the play-off with Denmark, it all fell to pieces in Dublin 4. "Ideally, we'd love it to be the case where teams hate coming here," said goalkeeper Darren Randolph, who referenced his brilliant debut against Germany as a counterpoint. "I agree if we were able to turn the Aviva into a fortress, it would obviously help us and go in our favour." The players said they would prefer if the fans were concentrated on the game, rather than any other shenanigans, without stating they'd have any particular issue with protests. "It would be a lot easier to go and play if the Aviva is rocking, if there is an unbelievable atmosphere," added Randolph. That comes down to the players too, of course, and it's a series of ponderous starts at the venue that contributed to the negative mood around the end of the O'Neill days. There's a very different type of unease hanging over things this time around but the basic premise is the same in the sense that a purposeful start can at least serve to function as a distraction from worthy grievances. McCarthy had no interest in discussing O'Neill's woes, but said that a "fast, aggressive, attacking" performance would help to lift the mood. That language was also used ahead of October's UEFA Nations League double-header, matches that concluded with a grand total of zero Irish goals. A dull November scoreless draw with Northern Ireland sealed that management team's fate. The concern during the Gibraltar match was that the players remain gripped by an inability to really break out of their shell, although McCarthy pointed to Jeff Hendrick's purposeful run for his goal as a sign of improvement. He indicated that he views Hendrick as a central option for a longer term and that certainty should bring more out of the Dubliner. From a tactical perspective here, the choice of his partner or partners will open a window to the Irish approach. There's an argument for sticking with Conor Hourihane next to Hendrick with David McGoldrick further ahead functioning as a link player. Matt Doherty is in danger of missing out, with McCarthy offering a brief response when asked if Robbie Brady was being considered as an alternative which didn't exactly dismiss it. That said, it wouldn't be a massive surprise if Alan Judge was considering for involvement at some stage. He is well regarded by McCarthy and if there's a shock in terms of selection then he might be a candidate. McCarthy has watched Ireland's previous battles with Georgia and said he was well aware of their strengths. "You're all asking me these questions about Georgia but you've seen more of them than me," he shrugged at one point. "You all know what a damn good team they are. "You all know it. You're trying to find something else that I know more than you but I don't, except that they're a good team." They posed Switzerland problems in Tbilisi before folding after the interval. For a team that can sit deep, they were surprisingly open for both goals with Switzerland finding space through the middle. McCarthy has not committed to sticking with Seán Maguire as support for McGoldrick, yet acknowledged that the Preston player was dissatisfied with his display and told his manager as much yesterday morning. "He said that he was as nervous as he has been, strangely enough," he said. "I don't think we got the best out of Seán with some of the service. "He's a runner so that's when you get the best out of him. He's quick and athletic and if we can get him slid inside anywhere in the box, then he's a threat and will score goals." In the wide expanses of the Aviva, the Irish aim should be to stretch their guests rather than finding themselves pegged back. Energy is better than anxiety, although McCarthy knows this game and this particular job can deliver a bit of everything. "I've never sat there as a manager thinking, 'I feel comfortable doing this job'. Never," he said, "I'm on the edge." The challenge for tonight is to give the natives something good to shout about.